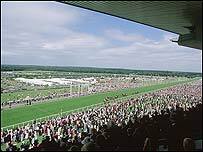 Royal Ascot, one of racing's most famous occasions, may be moved from its traditional home in Berkshire in 2005 as a massive building programme takes place. Officials for the course admitted there is a chance the meeting could be moved for the first time in almost 300 years - with York as a possible alternative. The owners of Ascot are embarking on a £180m re-development of the site with the aim of making it the best racecourse in the world. "We're going to build the finest racecourse in the world in order to meet our customers' expectations in the future," said Douglas Erskine-Crum, chief executive of Ascot racecourse, last June. "There are a number of features to it, including moving the track over 40m from the winning post to create more room and a stunning new stand with an innovative roof structure." The course first staged racing back in 1711. The redevelopment will also include creating a new parade ring with step viewing for 9,000 racegoers in a position that is more accessible than the current one. The project will be spearheaded by Rod Sheard of HOK Sport, who were responsible for Sydney's Olympic Stadium and Cardiff's Millennium Stadium. "We're going to build a new pre-parade ring returned to its historic location, with saddling boxes and a new silver ring," Crum said. "What we're doing is building a racecourse for the future. "It is a great racecourse now, but we have to think what our future customers want in 10 or 20 years time. "This redevelopment won't start for a few years yet. So this is a long term plan to put us right at the front of world racing." Ascot welcomes over 500,000 racegoers each year, with the Royal Ascot meeting in June one of the most popular and prestigious in the world.